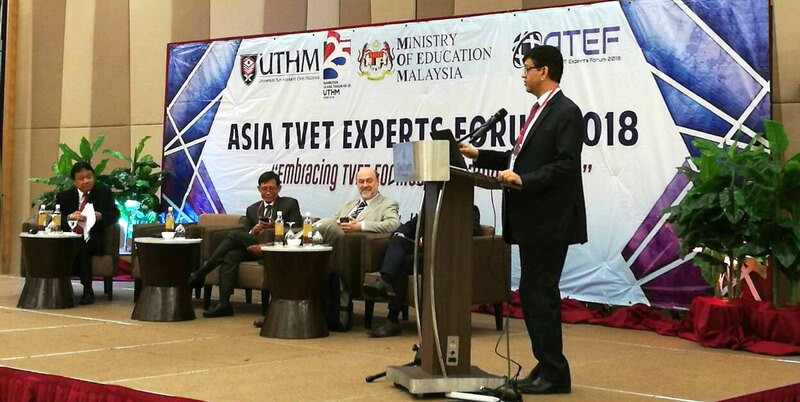 In his capacity as the Director General of CPSC, Dr. Ramhari Lamichhane presented a paper on the role of professional bodies ushering TVET for the Industrial Revolution 4.0 at the 2018 Asia TVET Experts Forum (ATEF) held from July 23-24, 2018 at the Everly Hotel in Putrajaya, Malaysia. The event was organized with the theme, “Embracing TVET for Industrial Revolution” which aimed to discuss perspectives of various TVET providers and institutions on how to address the impact of the 4th industrial revolution. Participated by 57 experts coming from countries such as Malaysia, Philippines, Bangladesh, Indonesia, Singapore, Brunei, Vietnam, this forum was organized by Universiti Tunn Hussein Onn Malaysia (UTHM), within the purview of the Ministry of Education Malaysia, and in partnership with the Asia TVET Experts Network (ATEN). Lessons learned in this event will be carried over to the next ATEF Meeting tentatively scheduled in May 2019 at Ningbo Polytechnic in Ningbo, China. Group Picture of the ATEF 2018 Participants. After the event, the Director General was also able to meet the officials of the Department of Polytechnic and Community College Education (DPCCE), Ministry of Education, Malaysia to discuss future activities for cooperation such as the planned in-country programs in Malaysia, future APACC onsite visits and other important matters.